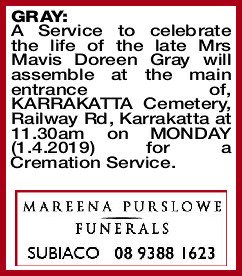 A Service to celebrate the life of the late Mrs Mavis Doreen Gray will assemble at the main entrance of, KARRAKATTA Cemetery, Railway Rd, Karrakatta at 11.30am on MONDAY (1.4.2019) for a Cremation Service. 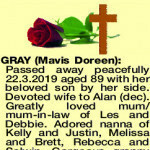 Passed away peacefully 22.3.2019 aged 89 with her beloved son by her side. Devoted wife to Alan (dec). Greatly loved mum/ mum-in-law of Les and Debbie. Adored nanna of Kelly and Justin, Melissa and Brett, Rebecca and Selwin. Gorgeous granny to Beau, Talise, Ash and Arley. Much loved sister/ sister-in-law of Dulcie and Keith (dec), Ron and Judy. Caring aunty, cousin and valued friend to many. An incredibly warm, sincere, genuine loving Christian lady who endeared herself to all who were part of her journey. She was cared for with great dignity, respect and love by the wonderful staff at Juniper Balcatta in the latter years of her life - our heartfelt thanks to them. 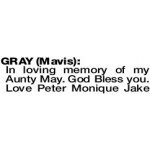 May the gracious Lord grant her eternal peace. 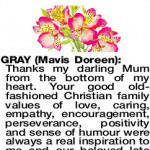 Thanks my darling Mum from the bottom of my heart. Your good old- fashioned Christian family values of love, caring, empathy, encouragement, perseverance, positivity and sense of humour were always a real inspiration to me and our beloved late husband/father Alan. You have both always been a very hard act to follow but I've tried very hard to make you proud. Our love of playing music was always a special bond, particularly in recent years when conversation became difficult for you. 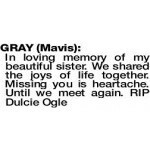 Our family is a closely united one because of the loving example you always provided. I will miss you in so many ways Mum, especially hearing, "I love you" and "God bless you", but all the fantastic memories and the knowledge you are now resting peacefully will sustain me. Thank you Mum for accepting me with love into your caring family 41 years ago. You have left me with so many wonderful memories I will treasure. You are now at peace having a cuppa with your beloved Alan. Always in my heart, Debbie. Nan, we will miss your happy smile, infectious giggle and the beautiful, kind and generous person that you were. May you rest now and finally be reunited with pop. Love you always, Kelly, Justin, Beau and Ash. Nanna, your contagious laughter and love for music will be forever missed but instilled in the generations to come. Your heart was always warm, we'll miss you. Love Melissa, Brett, Talise and Arley. 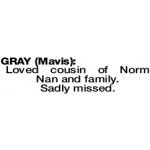 GRAY MAVIS Loving and caring sister of Ron and Jude now resting peacefully with Alan. Loved cousin of Norm Nan and family. Sadly missed. Our heartfelt sympathy to Les, Debbie and family. 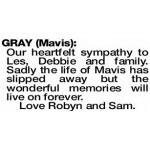 Sadly the life of Mavis has slipped away but the wonderful memories will live on forever.